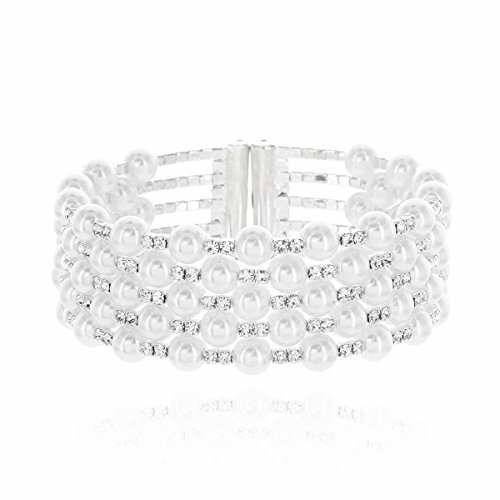 This modern spin on a bridal classic Multi Strands Pearl and Rhinestone Bangle Bracelet is the perfect addition to your special occasion or casual wardrobe. This top selling adjustable wrap around bracelet is one size fits all and is perfect for giving any outfit the glitz and glam needed. MATERIAL: Made of hand crafted lustrous 6mm simulated pearls and delicate sparkling Austrian crystal rhinestones. STYLE: Best selling 5 row hinge pearl and rhinestone wrap around bracelet adds all the glitz and glam! TYPE: Packaged in a beautiful embossed signature Naccessories Gift Box. Great for formal event, gala, church, dressing up, wedding/bridal party jewelry gift, birthday party, gift giving, special occasions, Valentine's Day, Mother's Day, Anniversary gifts, Proms, Parties, Bridesmaids, Mother of the Bride, Formal Parties and more! If you have any questions about this product by Naccessories, contact us by completing and submitting the form below. If you are looking for a specif part number, please include it with your message.